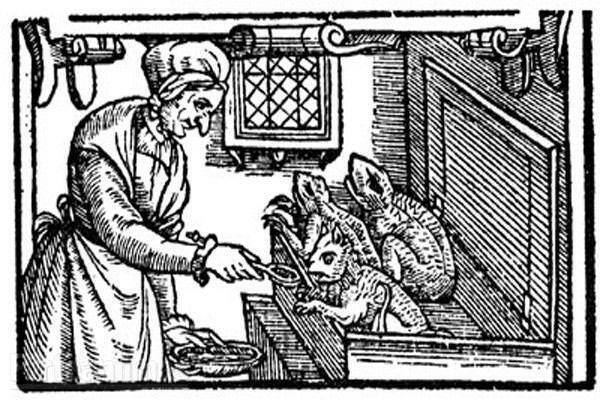 An image of a witch and her familiar spirits taken from a publication that dealt with the witch trials of Elizabeth Stile, Mother Dutten, Mother Devell and Mother Margaret in Windsor, 1579. Synopsis: This paper explores the possibility that the witchcraft trials are a large-scale example of violence and scapegoating prompted by a deterioration in economic conditions. In this case, the downturn was brought on by a decrease in temperature and resulting food shortages. The most active period of the witchcraft trials coincides with a period of lower than average temperature known to climatologists as the “little ice age.” The colder temperatures increased the frequency of crop failure, and colder seas prevented cod and other fish from migrating as far north, eliminating this vital food source for some northern areas of Europe. Several kinds of data show more than a coincidental relationship between witch trials, weather and economic growth. In a time period when the reasons for changes in weather were largely a mystery, people would have searched for a scapegoat in the face of deadly changes in weather patterns. “Witches” became target for blame because there was an existing cultural framework that both allowed their persecution and suggested that they could control the weather. Introduction: etween the thirteenth and nineteenth centuries, as many as one million individuals in Europe were executed for the crime of witchcraft. The majority of the trials and executions took place during the sixteenth and seventeenth centuries. During this period, the speed and volume of executions were astonishing: in one German town, as many as 400 people were killed in a single day. The trials were ubiquitous: conducted by both ecclesiastical and secular courts; by both Catholics and Protestants. The victims were primarily women, primarily poor and disproportionately widows. The persecutions took place throughout Europe, starting and ending earlier in southwest Europe than in the northern and eastern areas, and spread even across the Atlantic Ocean to Salem, Massachusetts. Although witchcraft trials in Europe and America largely ended by the late eighteenth century, witchcraft accusations and killings still take place in many countries today, particularly in the developing world. For example, witchcraft is often blamed for AIDS deaths in sub-Saharan Africa, and Miguel shows that negative economic shocks are associated with increases in witch killing in modern Tanzania. Belief in the witch, and fear of her, is enduring.